My last blog explained why a manager’s most important duty is to hire good people. Without the right people in the right positions, your department will always be mediocre — no matter what else you do. Today we’ll discuss the hidden reason for turnover, and the greatest threat against retaining good people in any organization. The reason is poor management! Turnover is a symptom of poor management. If bad managers and supervisors didn’t chase away so many workers, the high cost of turnover – and the need to hire and train replacements – would diminish. Consistently, over the years, studies have shown that workers leave because of their immediate boss in about 70% of cases. They don’t quit their job – they quit their boss. Most managers and supervisors are not bad people, but they got promoted because of their good technical or professional skills, not because they have good managerial skills. And once promoted, most don’t get the training they need to succeed in a management position. Consequently, many managers fail, and employee satisfaction never seems to improve. Dissatisfied, turned off, unmotivated employees look for better jobs, and the organization continues with the challenge of attracting and keeping good people. An employee with a decent boss and a good job with responsibility, autonomy, and opportunities to achieve, is unlikely to look for a different job. But for this to happen, managers and supervisors must learn how to create enriched jobs that motivate and lead to satisfied, happy workers. Enriched jobs provide plenty of responsibility, a complete job (all the pieces) that results in a definable product or service, and some autonomy on how and when the work gets done, as long as it is done right and on time. This takes training and the manager or supervisor’s willingness to listen and learn. Sadly, most fail to recognize that they could do a much better job, so they don’t seek training. So the need to attract and keep good people continues on. And the real problem – poor management – never gets fixed. For managers who do recognize they need training, a small investment in time and cost is well worth it when you consider the benefits of less turnover. 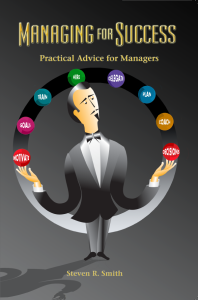 My 150-page book: Managing for Success: Practical Advice for Managers was written to help managers and supervisors learn how to succeed in their jobs. It includes chapters on enriching jobs and motivating employees, and on the management style needed to achieve this.